WELCOME to a world of affordable luxury, beauty and hospitality in a romantic Madison Wisconsin area bed and breakfast & genuine getaway on 120 scenic Dane County acres. TripAdvisor is proud to congratulate Cameo Rose - Madison's Victorian Country Inn on repeatedly earning the prestigious Certificate of Excellence award. Cameo Rose is a secluded Madison WI area bed and breakfast retreat offering distinctive guest rooms, whirlpools, fireplace rooms, antiques and other Victorian treasures, inn decor of white lace and roses, glorious flower gardens, 3 waterfalls, serenity pond, rolling hills, woodlands, miles of private hiking and skiing trails and numerous scenic views. "I never felt so refreshed" ~ Guest. MORE ACCOLADES:"One of the most attractive B and B hotels in the United States ~ WSJ; "Best beds" ~ guests; "Best breakfast in the Midwest" and "#11 B&B/Country inn throughout North America" ~ Arrington's; Most Romantic ~ American Historic Inns; "One of the finest getaways in the Midwest." ~ Bob Puhala, Chicago Sun Times; Cameo Rose is "a special place" ~ guests. SO CLOSE TO EVERYTHING:Yet, so far from the stress you leave behind. Our B and B is only 7.5 miles South of vibrant Madison WI; 4 miles North of the Beautiful Belleville; 1 mile to the new Badger Bike Trail and Ice Age Trail; 7 miles from Epic Systems Data Center Campus; 15-25 minutes to Madison Beltline, University of Wisconsin; Downtown Madison; New Glarus ("America's Little Switzerland); Mount Horeb ("Little Norway") and 101 things to do. AMENITIES:Defining the Cameo Rose difference. Enjoy Dawn's check-in-time and evening beverages or sweets. Hike, ski, snowshoe miles of private trails. Hear the birds singing and watch the deer and wild turkeys roam. Relax on swings-for-two or a lazy hammock. Get a great night's sleep on a top-of-the-line Verlo mattress. Wake up to the aroma of fresh blended coffee, baked goods and a memorable breakfast. Take home the memories. THE INN:Hospitality of a bed and breakfast * Artistic decor, elegance and comfort, roses and white lace, Victorian era treasure, inn ovations. * Gazebo-shaped living room with fireplace * Air Conditioned * Wraparound porch with scenic views * Guest Refrigerator * Business Travel * WiFi * No building-wall views, no bright streetlights, no sirens, traffic, or train noises, and no room taxes or parking fees like Madison hotels. THE GUEST ROOMS:Five distinctively decorated guest bedrooms for romantic escapes * Air conditioning, Fireplaces in most rooms * Whirlpool room * Whirlpool Suite * Wedding and Honeymoon suite * Group suite sleeps up to 6 adult guests ideal for family travel, a girlfriends getaway, group events, retreats, reunions or vacation getaways * First floor room * Luxuriously comfortable king beds and queen beds * Kohler Private baths * Rain Forest Showers * Plush spa robes * Fine linens * CD player & Radio, Television, TV DVD, VCR in whirlpool tub rooms * WiFi, Tower reading room * Wicker-filled tower sunroom * Ceiling Fans in most rooms * Insulated inside walls * Real closets * Hair Dryers * Iron and ironing board available. THE GARDENS AND 120 SCENIC ACRES:Stay and smell the roses and floral gardens * English Cottage Gardens, gazebos and pergolas * Authentic on-site views * 100 year old oak trees * Hills and rock formations * Immense peace and quiet * Hand-in-hand strolls on miles of private trails with berry patches * Birding, hawks, Sandhill Cranes, deer, wild turkey and occasionally eagle watching * Glorious sunsets, moonlit nights, stargazing. THE BREAKFAST:Voted Best in the Midwest * Full gourmet complimentary four-course breakfast * Dawn's B&B recipes elegantly served on vintage china and lace. THE INNKEEPERS:Dawn and Gary Bahr will pamper you from the moment you arrive. Country Extra says Cameo Rose "sparkles with hospitality." Dawn's attention to detail and fine dining, antiquing, shopping and tourism suggestions will make your travel Wisconsin vacation extra special. Dawn gave up business administration and wanted a bed and breakfast in Wisconsin between Belleville, Cambridge, Fitchburg, Oregon, New Glarus and Verona. Gary retired from banking and wanted a small cabin in the woods. Cameo Rose is "their" compromise. 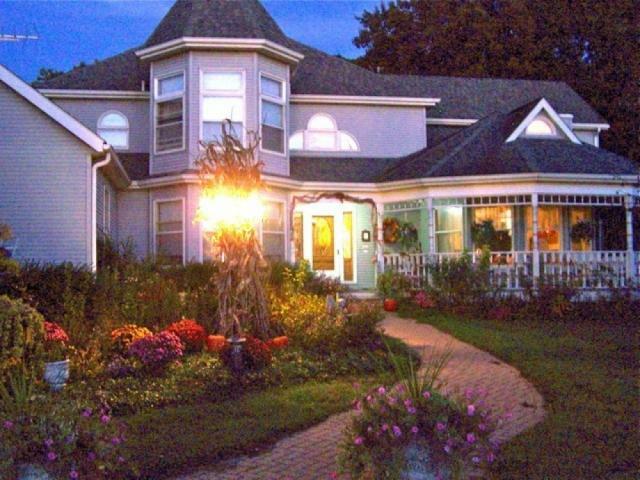 101 SOUTHERN WISCONSIN ATTRACTIONS AND THINGS TO DO:Midwest Living declares Cameo Rose "The perfect Victorian in a great location." For extended-stays, plan your vacation and a variety of day trips to our bed and breakfast, area attractions and to scenic splendor. See our web site pages (www.CameoRose.com) under "The Area" for more Madison events and activities. * MADISON (7-12 mi) Alliant Energy Center, Dane County, Memorial Coliseum, Exhibition Hall, The State Capital, Capitol Square, Capital City Bike Trail, Chazen Gallery, Frank Lloyd Wright Monona Terrace Convention Center, Golf Courses, Kohl Center, Airport, Farmers Market and Museum of Contemporary Art.